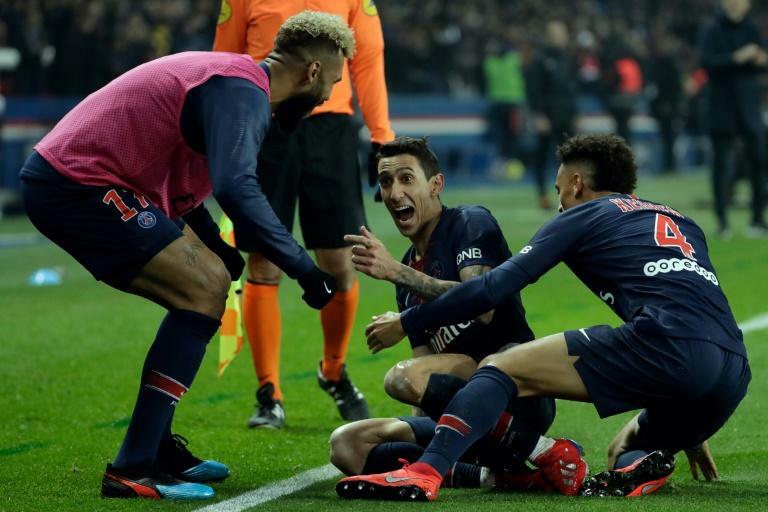 Angel Di Maria scored twice as Paris Saint-Germain eased to a 3-1 victory over Marseille on Sunday to extend their long unbeaten run against their arch rivals and move 20 points clear at the Ligue 1 summit. A group of PSG ultras were boycotting the opening stages of the game over the team's shock Champions League defeat by Manchester United, but when they arrived they were given a 16th win in 19 meetings with Marseille, alongside three draws, to cheer. Banners reading "We don't forget", "respect the establishment" and "banknotes in place of a heart" were hung in a section behind the goal to make clear supporters' unhappiness at PSG's 3-1 home loss to United on March 6. "There are some thing we can't change, we have to accept that we had a very, very sad defeat -- very, very bad for us. But we started again at Dijon (last week) and even today the guys showed their character," said PSG coach Thomas Tuchel. "I'm glad we could show that today, because it's important for our supporters and for us." Kylian Mbappe put PSG in front on the stroke of half-time with his 26th league goal of the season, but Valere Germain equalised in the first minute of the second period. Argentine Di Maria restored the home team's advantage, though, and Marseille 'keeper Steve Mandanda was sent off for a clear handball 30 yards from goal. Di Maria's wonderful free-kick added further gloss to the scoreline, although Mbappe saw a late penalty saved by visiting substitute Yohann Pele. The capital giants have not lost to Marseille since a 3-0 defeat at the Stade Velodrome in November 2011. With the Ligue 1 title effectively secured, the only competition left for PSG to play for this season is the French Cup, in which they face Nantes in the semi-finals next month. Mario Balotelli had the first shot in anger, shrugging off the PSG defence before seeing his long-range drive well held by home goalkeeper Alphonse Areola. The missing ultras did not miss much goalmouth action early on, but many rushed to their seats when they thought Di Maria had put the hosts in front, only to see the effort ruled out for offside by VAR. Marseille did well to keep their rivals at arm's length for the opening 45 minutes, although injuries which forced the substitutions of PSG full-backs Thomas Meunier and Dani Alves contributed to the game's scrappy nature. But PSG forged ahead in the second minute of first-half injury time, as they broke at pace from a Marseille corner and Di Maria played in Mbappe to sweep the ball past Mandanda. Rudi Garcia's away side stunned the Parc des Princes just seconds after the restart, though, as Lucas Ocampos raced clear and squared for Germain to slot into the bottom corner. Marseille grew in confidence, but that left space for PSG to exploit, and Di Maria cut inside from the right and curled a fantastic 55th-minute finish past Mandanda to score his fifth goal in six matches. The match was all but ended as a contest just after the hour mark when Mandanda raced from his line and dived to handle yards outside of his area in a moment of madness which left his side a man down. Di Maria ensured PSG did not wait long to take advantage, hammering a swerving strike from the resulting free-kick past Pele, who was brought on for the ineffective Balotelli, and in off the post. Mbappe missed the chance to score a second himself in added time, as his penalty was saved by Pele after the World Cup winner was bundled over by Hiroki Sakai. Earlier on Sunday, Lyon strengthened their grip on a top-three spot with a 3-2 victory over Montpellier, moving six points clear of fourth-placed Marseille. Bruno Genesio's men, who were thrashed 5-1 by Barcelona in the Champions League last 16 in midweek, saw off their fellow European hopefuls with goals from Martin Terrier, Moussa Dembele and Houssem Aouar.